[SKF NOTE: I have yet to do a complete inventory, but I know I have several cuts from at least some of these shows on various Coltrane albums. Every cut I’ve heard has first-class, experimental, straight-ahead musicianship. And Elvin Jones plays great throughout. 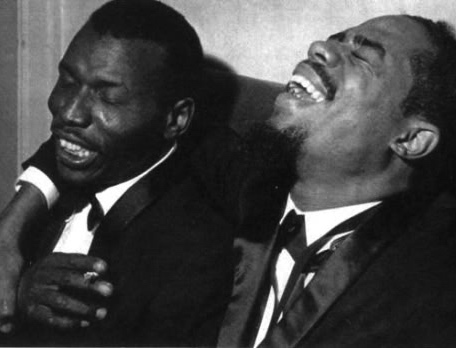 There’s been plenty of bootlegged material over the years from this celebrated 1961 tour by John Coltrane with saxophonist and bass clarinetist Eric Dolphy…. Now Acrobat has remastered tapes from six shows in Paris, Copenhagen, Helsinki and Stockholm and pulled them into a useful four-disc set…. Coltrane had not long formed his “classic” quartet with pianist McCoy Tyner, bassist Jimmy Garrison and drummer Elvin Jones, and in 1961 had also forged a brief but creative association with Dolphy. Their fearless stretching of the postbop envelope remains enthralling (at times even shocking) in its intensity, and the set pinpoints how the same pieces (including Blue Train, Impressions, My Favourite Things and Naima) change from night to night. Acoustics are inevitably uneven, but students of Coltrane’s gamechanging work at a conceptual turning point won’t mind that. This entry was posted in Drum/Music News and tagged Acrobat, Drummer, Elvin Jones, Eric Dolphy, Jimmy Garrison, John Coltrane, McCoy Tyner, Scott K Fish. Bookmark the permalink.